It appears that some of my recent prayers have been answered with either a “Not yet” or a “No”. I recently learned that the second series in Fr. Robert Barron’s series entitled ‘Catholicism’, which focuses on the New Evangelization (see here for one review) will be coming from an exclusively Roman Catholic background. This was the case in the first general overview DVD series on Catholicism, which led me to write this post. Two points stand out: one cannot be fully acquainted with something if one does not know that it exists, and it’s unfortunate that this series has not helped Roman Catholics (and the world) know about these treasures from the East. In summary, I’ve tried to emphasize that the Church is not very Catholic if she does not include these authentic Traditions of both East and West. A series like the ‘Catholicism’ DVD series is more aptly title ‘Roman Catholicism’-the problem with such an appellation is it doesn’t sound very Catholic. But that returns to my point mentioned above, and leads me to ask God for mercy on all of us. With all of these criticisms borne in mind, I wasn’t intending to write this to complain. Nor was I only hoping to call others (and myself!) to prayer that East and West appreciate each other more. That’s all well and good, and worthy of a lifetime of prayers. What comes to mind as I reflect further on the absence of Eastern Catholics in a ‘Catholicism’ series today is to ask why this is the case. There are doubtless multiple answers to this that are possible, and likely some of them are true in actuality. The Prayer of Saint Ephrem states, “let me see my own sins and not judge my brothers…”, and to that end these meditations and questions come to mind, as to the why of our absence. Have we reached out to the world to evangelize with the Light of the East, or are we content to live in a small world of like-minded Eastern Christians? How often do we reach out to those who are already our Brethren? Do we invite Roman Catholics to our liturgies so that they can understand us better? Do we accept invitations (or just show up!) to Western Catholic services to visibly exemplify the fact that we are in communion with each other, despite belonging to distinct particular Churches? 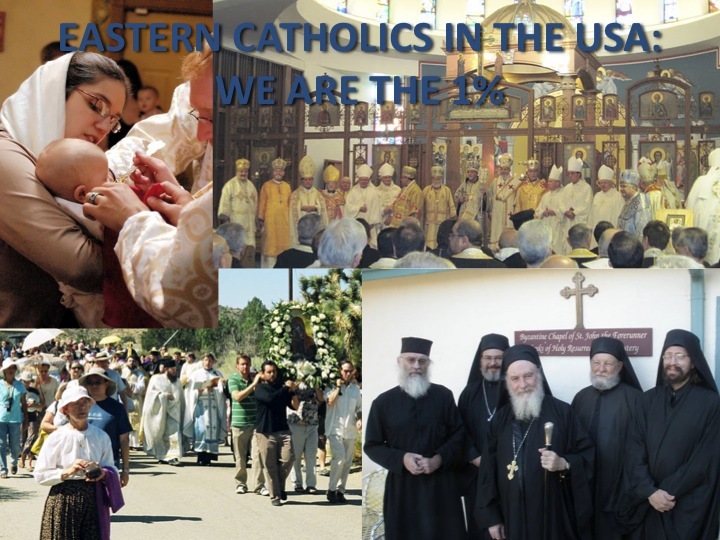 Can we identify ways where the faith is growing due to our prayers and evangelization as Eastern Catholics, that might inspire others to look more into what it means to be an Eastern Christian? Are we living the depth and fullness of our Tradition, or does our Eastern Christianity appear to simply be “a different Mass”? These and other questions come to mind, but at the end of the day I think it’s safe to say that we can consider ourselves to blame. It didn’t seem like a big omission to not talk about Eastern Catholics in this series (at least at this point in the series) because our presence does not seem like a critical part to telling a complete story. We are either too insignificant or our differences which highlight the beauty of the Church are not clearly seen. Perhaps that’s our fault because we live in such a way. May God grant more fervor and zeal to the Eastern Catholic Churches and their Faithful, that such a perception goes away through our living out the New Evangelization! It reminds me of this old ‘meme’ that I made awhile back. We may be small in numbers, but if we love our faith we can have a lasting impact on the world, as did the Apostles. Through the prayers of our holy fathers O Lord Jesus Christ Our God, have mercy on us!